He's a writer, a stand-up comedian, and an actor, but Scott Thompson will likely always be best known as one of five members of The Kids in the Hall, one of the best sketch comedy groups ever. Scott has made a lot of people laugh, but his life has been filled with events that aren't funny at all: a school shooting, mental illness in his family, violence, cancer, professional setbacks, and a firebombing. We hear about what knocked Scott down and how he kept managing to get back on his feet. Comedian and actor Chris Gethard has a lifetime of experience with depression. Chris has turned moments of his life dealing with the illness into an off-Broadway show and an HBO special, which is more than one might expect from a fight-prone, often manic, kid from West Orange, New Jersey. We cover a lot of ground in this talk, including the role of a racist homeowner in his lowest moment. Young people can be morose, angry, withdrawn. It's often chalked up to being a "phase," a natural initiation ritual to adulthood. What if it's not? What if it's a mental disorder in need of help? We hear from the always-entertaining comedian and writer Jen Kirkman about her efforts to understand her head. We also talk with Jennifer Rothman, NAMI's Sr. Manager for Youth and Young Adult Initiatives and Dr. Sue Swearer of the University of Nebraska. Plus, a montage of past guests trying to figure out what the hell happened in adolescence. Long before Neko Case was known as one of the top singer-songwriters working today, she was a punk teenager running around the streets of Tacoma, having ditched a neglectful and dangerous house. Fortunately for her and her eventual fans, she got her life on track, developed a strong interest in music and threw herself in to making it. We hear about how she got herself together in spite of her parents, how depression came to wallop her, and what she did to get on track once again. Plus, we hear about how she joyfully wept when trying to talk to Janelle Monae's backing band. We asked you, our listeners, for the songs that help you most when depression is really acting up, and the stories behind those picks. On this episode hear stories about and music from Leonard Cohen, Bjork, Neil Young, Radiohead and so much more. We even get some peaks behind the songs from Craig Finn of The Hold Steady and former American Idol star Crystal Bowersox. You can think of Dave Nadelberg's vast Mortified project as The Hilarious World of Embarrassment, Awkwardness, and Redemption. Through stage presentations, film, TV, and books, Dave invites people to share their most mortifying writing. It's very funny, sure, but it's more than that. Dave says the process of dragging your younger self out of that old trunk can provide understanding of who you were and what motivated you. That, in turn, can offer valuable insight into who you are. Also in this episode, John is dragged kicking and screaming into revealing his 2nd grade secret identity. A lot of rappers are heavily influenced by the rough and real streets where they grew up. Mike Eagle grew up on those streets too but he was always inside, reading books and watching TV. He loved comedy, cartoons, and especially the wide range of music available on cable, everything from N.W.A to Spin Doctors. Those influences, as well as his unusual mind, make for a fascinating sound. Ever wonder how 90s pop and rap mix with anxiety, depression, isolation, psychology, and comedy? Take a listen. You know the feeling, right? You finally achieve something -- a new job, a promotion, an award -- and while you know you should be proud, you just feel like a big phony who will soon be exposed. You feel like you don't really belong there and you suspect that someone else should be there instead. It's called Impostor Syndrome and it's more common than you might think. We're joined by Dr. Valerie Young to talk about who it effects and what to do about it. And we're joined by you, our listeners, sharing stories of Impostor Syndrome at its most ludicrous and the unorthodox but effective ways you've found to treat it. Yeah, you don't hear a lot of on-stage material from Chris Rock or Sarah Silverman about the time they were on a mission with their unit in Iraq and they took a bullet to the back of the skull. But you hear about that from Thom Tran, a US Army veteran and Purple Heart recipient who not only talks about his experiences on the battlefield but shows video on stage of that injury as well. The Vietnam-born, Buffalo-raised comedian is based in Los Angeles now, gathering acclaim for his jokes and stories while working to help other veterans find the next chapter in their lives. Here's a repeat of an episode originally aired last year. We're offering this repeat because some things need repeating, such as how to get help for your mental health when you really need it. It's a conversation with Dr. Ken Duckworth, Medical Director for the National Alliance on Mental Illness, and it's practical advice. A lot of people will say "get help" for mentaln illness; here's what you can do to make that happen. Although she comes across as confident and happy on her incredibly successful YouTube channel, Hannah Hart has plenty of experience with insecurity and misery in her life. Growing up, she faced severe poverty, hunger, and dealing with a mother who was mentally ill. Still, she made it into a good college where she had to confront issues about her religion and her sexuality on her way to getting two degrees and not being able to be proud of any of it because of depression. Today, she's a star, dispensing advice on life, relationships, and how to cook when you're completely drunk. Life is full of unexpected paths sometimes. This is our final episode of season 2, but stay tuned for season 3 and bonus placebo episodes between seasons. It's hard to settle on a musical description for Ted Leo. We ended up going with "if The Beach Boys were '80s skateboarders" to summarize his melodic intense post-punk sound. Similarly hard to nail down is whether Ted's longtime issues with depression and anger stem from his brain's built-in wiring or from abuse he suffered as a kid and barely ever talked about since. Rachel Bloom has never moved across the country to chase a boy like Rebecca Bunch did. Rebecca is the character Rachel plays in "Crazy Ex-Girlfriend," the hit show she co-created and stars in on The CW Network. But Rachel does have a long history of messed up romantic relationships -- plus depression and intrusive looping thoughts. And her career really took off when she got inspired by another Rebecca: Rebecca Black. You, know. That 2011 song "Friday?" Yep. Before she was the host of NPR's popular Pop Culture Happy Hour podcast, Linda Holmes was an attorney working at the Minnesota Legislature. Before that, she was a student living in squalor. And before that, she was the victim of some seriously messed up mean kid behavior. We hear about her unusual path to a better life, the older and very recent struggles she has had, and how the written word proved redemptive. We also hear about how Linda's weight was seen as a symptom of her depression when in fact the depression itself was the problem all along. If you've ever heard this show before, you've heard singer-songwriter Rhett Miller. He wrote and performs the theme song about "the world's greatest clown." On this episode, Rhett tells of his teenage suicide attempt, a mysterious illness, his musical salvation, and his grandmother's owl fixation. He even brought his guitar along and performs a few songs. New York comic Janelle James never even imagined being a comedian. She had grown up in the Virgin Islands, worked in fashion PR, had two kids, and was living in Illinois when she first walked on stage at an open mic night. She was 30 years old. But as soon as she hit the stage, she knew this was her calling and many years later she's headlining clubs all over the country and is a comedy star on the rise. She talks about trying to outrun her depression, dealing with depression-induced physical pain, and a therapy session that did not work out. Special guest: neuroscientist Daniel Levitin. We've gathered up a whole lot of tips, tricks, ideas, and stories to help you get through this time of year when merriness and jolliness aren't always in abundant supply. Hear holiday thoughts from Wil Wheaton, Margaret Cho, Jenny Lawson, John Green, Aimee Mann, and more. Plus, a story about a slobbering zebra. You know those things that happened but that you don't talk about very much? Or even at all? Because they're too upsetting? In this episode, host John Moe and guest Ana Marie Cox put those things on the table. Ana is a journalist, pundit, and podcaster; she talks about the lowest point in her mental health, a horrible decision, and what came next. John talks about the event that led to this podcast being created in the first place. This is a re-broadcast of an episode from last spring that has garnered a huge response from listeners, and it's presented largely without edits. Growing up, actor and writer Julie Klausner was too busy battling depression and daydreaming about an imagined Merlot-sipping cosmopolitan adulthood to really engage in the world itself. It wasn't until she entered the world of comedy and improv as an adult that things really started to click into place. That led to creating Difficult People, a show on Hulu, where she plays a much bolder, brassier, and more oblivious version of herself. Long before Jeff Tweedy was the founder and leader of the enormously popular band Wilco, he was a kid in Illinois with severe migraines and a tendency toward anxiety and depression. He cycled through alcohol, marijuana, and, finally, opioids to try to get to the point of feeling normal and okay, even relying on a fan who worked at Walgreen's to score him the pills he wanted. Finally, a stint in rehab and a return of self-confidence got him back on track. There's a really sad and darkly funny story in this episode involving a teddy bear and a jar. Although Gary Gulman has been a successful stand-up comedian for decades - with acclaimed specials, a loyal fan base, and appearances on all major late night shows - this was not his original plan. Gary is 6'6" and athletically gifted, he loved basketball, and had a full ride athletic scholarship to a Division 1 program. Problem is, he had no killer instinct. He had more of a comedian instinct. Hear Gary's journey through a lifetime of deep depression, impossible standards, and some of the funniest and weirdest comedy out there today. Author John Green had one of the best-selling books of the last 10 years with The Fault In Our Stars. The problem is, when you write an acclaimed smash hit, everyone wants you to somehow do it again. In attempting to write that follow-up, Green went off the meds he'd been taking for Obsessive-Compulsive Disorder, hoping it would bring him to a more vivid and imaginative place. Instead, the crash made him unable to write at all. Hear how Green later used those dark days to craft the protagonist in a new novel, plus growing up with OCD, being a public figure in the privacy of his own home, and what it's like to read book reviews by people who haven't read the book. If you've enjoyed any comedy in the last 20 years, there's a good chance Neal Brennan helped make it. He's a veteran comic, writer, director, and co-creator, with Dave Chappelle, of the acclaimed Chappelle's Show. Over the past 20-plus years, he's also tried everything he could think of to tame his depression. Hear Neal's epic journey to feeling pretty good. Neal Brennan's website. She's one of the most influential and innovative comedians of the last few decades, but before all that, Margaret Cho was a Korean-American girl growing up in the 1970s in San Francisco. 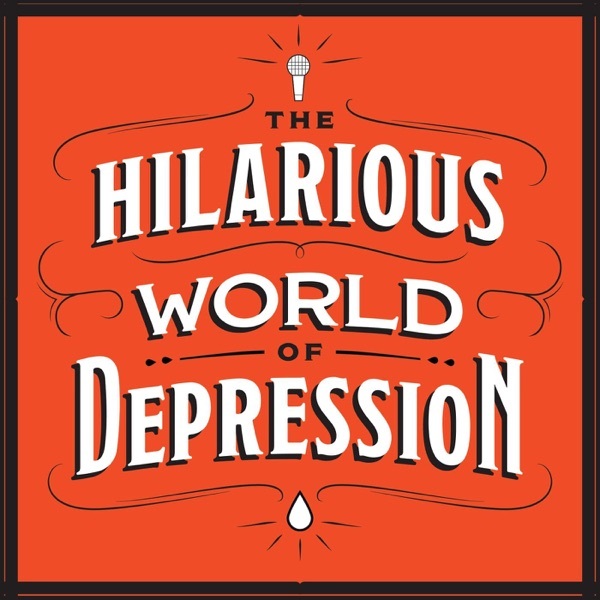 We hear about the sometimes very darkly humorous ways her family and culture dealt with depression and suicide, and how she harnessed her own depression to begin her comedy. Along the way, the keys to Margaret's often-shocking comedic style emerge and lead to making people upset in New Jersey. Wil Wheaton was a child star in Stand By Me, a regular on Star Trek: The Next Generation as a teenager, and has been trying to figure out his role in show business for a long time since then. He was dealing with the pressures of fame and the fickle tastes of Hollywood, all while dealing with a chemical imbalance in his brain that made him prone to anxiety and depression. Wil's better now thanks to medication, but despite his long IMDb page and regular work on The Big Bang Theory, his hit YouTube show, and a thriving and varied career, he sees himself primarily as a failed actor. What if clinical depression was not just a thing in someone's brain but an actual other person entirely? What would they look like? Act like? Who would they be? And how would you interact with such a person? It's a mental exercise that many find helpful in isolating the disease from the self to better manage it. We asked our listeners to describe their depression. Most chose humans, one chose a very confused monster. If you are having problems with your mental health, please get help. You've heard that before on this show and probably plenty of other places as well. But how do you actually do that? How do you go about finding professional help to get things on a better track? It's a process that can be complicated and overwhelming, which means loads of people don't get the help they need. On this episode, we talk with Dr. Ken Duckworth, Medical Director of the National Alliance on Mental Illness, about the simplest, best path to getting the help you need. Spoiler: it takes some work, but you can do it. Depression can be really hard to define, making it difficult for anyone who doesn't have it to be understand it. And that can make the people who do have it feel that much more alone. We asked our listeners what movie, TV show, artwork, or other piece of culture gets depression right. The answers range from John Cusack yelling out a window to Norwegian expressionist painting, to a cuss-filled bit of sour optimism in the Wild West. When we asked listeners about their favorite songs to listen to while battling depression, The Mountain Goats' music kept coming up. We caught up with the band's founder, singer, and songwriter, John Darnielle, to learn about what goes into his process. We also find out about the music he listens to and the other ways he copes with the depression that has dogged him for many years. Special bonus: a brand new John Darnielle poem.